Teamkitpro makes selling teamwear faster, more cost effective, more accessible and fun for your customer. It can work with your existing website, and can even be placed in-store as point of sale, on an iPad or similar device. 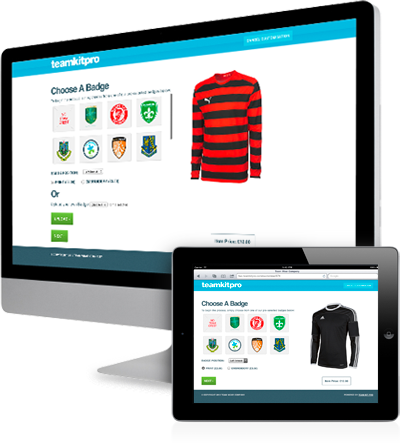 With Teamkitpro, customers can choose a garment from any brand that you stock, add their crest, sponsor logo, initials, names and numbers and get an instant price for their personalisation and garment saving you valuable time. This can then be emailed to the customer, printed, or shared with friends through social networking. Do you need more than the limits above? For unlimited enquiries, unlimited logos & crests, simply contact us for a bespoke price.